Make your powerpoints earn you Academic Recognition? Make your presentation to generate CITATIONS for you in a Scientific format? Make your Educational Presentations benefit Residents / trainees and Students? Share with Your Colleagues / trainees / Students? Get a Permanent WEB ADDRESS for you power point presentation which also safegaurds your Copyright? Be an ACADEMIC PHILANTHROPIST || Contribute Your KNOWLEDGE. 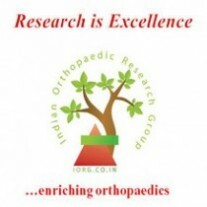 IORG Offers a platform where this information can be shared with more than ten thousand orthopaedic surgeons both in India and globally specially to Trainees and Students. Add to the Continued Orthopaedic Education Program. Please use the form below to fill in details of your Presentation and Upload the power point presentation. This detail will be used to to create a page on our website and the power point will be displayed in a flash format which will not allow direct copy of content. A citation will be prepared and added to the presentation page to allow citation of the powerpoint. The presentation will also feature in our monthly newsletter 'Ortho Mirror' and will be circulated to more than 10,000 orthopaedic surgeons.